This is near ALL the trains! 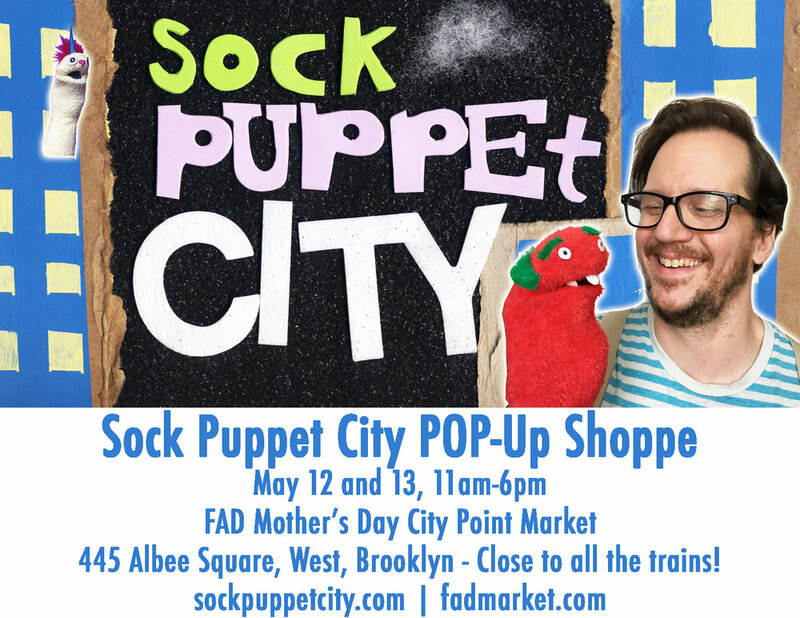 I'm tickled, pickled, and all puffed up to announce that Sock Puppet City will have its WORLD PREMIERE in person at the FAD City Point Mother's Day Pop-Up Market. Affirm an ancient truth: MOMS LOVE SOCK PUPPETS! Gang of awesome humans and their attractive pets, I know that, over the years, I've done many markets. But I say with a full and honest heart that FAD Market has been one of the best I've ever worked with. Their enthusiastic staff and well-curated shows are worth going to and supporting. They treat their artists and craftspeople with respect, and we need more markets like theirs. Check out the other vendors - it's a lot of cool stuff. Moreover, City Point is a good time. Come for the absolutely insane food court, stay for the amazing movie-going experience of spooky perfection at Alamo Drafthouse. You know you've been yearning for a mall that resonates with your fancy adult Brooklyn life but transports you back to your erstwhile rugged youth - let the 90's back in. Or the 80's or the 00's or the 40's or all of the youth-decades and mall-equivalencies combined.